All of us are born with soft, baby skin. However, in the course of life, it has to cope with variety of challenges … The sun, aging, and acne … leaving no one indifferent, reflecting both in the soul and on the face. “Scars adorn” – this saying fits neither women nor men nowadays. We do not seek to get scarred intentionally and, if we have them we hide them under assuring make-up mask. However, this is not an option. Especially, when natural looks, which is always trendy, is what we aim at. Our clinic provides complete acne scarring treatment program. You’ll have a possibility to choose a reliable combination of new generation laser and other procedures, that will allow reduce or completely eliminate scars caused by acne or various other surgical and burn scars. Short-term (6 months) and long-term (> 1 year) skincare programs, designed to smooth out the scars caused by acne and prevent formation of new ones, can be made. In each individual case, other treatment measures or methodologies suitable for of a particular skin type are discussed as well. The most common are narrow, pointy, approximately 2 mm in diameter, deep scars that reach deep dermis. The scar is wider on the surface and narrows acquiring the V shape at the base. Usually, they are localized on cheeks; located in small groups and form small, deep, punctured holes. They look like holes in the ice, and this is where the name comes from. Since scarring of this type of acne is deep, it is difficult to smooth them out using regular surface-treatment procedures. Treatments affecting deep layers of skin are used. This type of acne scars is also common, especially in the zones of cheeks and temples. The scars are angular, with sharp edges, shaped in a wide “U” form, often circular or linear. They are called shallow when reach depth of 0,1-0,5 mm and are successfully treated by regular laser procedures meant for surface renewal. Similarly, this type of scarring can reach middle layers of the skin, or even deeper scarring reaching down to the hypodermis can form. In both of these two cases, a combination of methodologies involving laser and skin renewal procedures affecting upper, deep, or all layers of the skin is required. In case when deeper skin layers are damaged, acne scars in shape of waves form – wide, 4-5 mm in diameter and shallow. Under them, the fibers of fibrous tissue are localized, which over time “pull” down the upper layers of the skin thus, forming the surface waves. In order to correct them, separation is often used during the treatment. Nodular, uneven, raised scars are often referred to as keloid scars. They are most likely to form in the chest, back, neck, cheeks and jaw areas. They form as a result of cystic or nodular acne because of hyper-production of collagen when the scar is raised above the surface of the skin and has a tendency to decrease in the long run. Drug injections are used; striking results are achieved by applying combined treatment methods. Post-inflammatory pigmentation, red or early acne scars. They are hard to conceal, and the redness makes both acne and scars more visible, even when the eruptions heal up. This is not real scarring – just post-inflammatory hyperpigmentation: pink spots, that tend to form when deeper skin layers are damaged, usually, in case of node cystic acne. Post-inflammatory hyperpigmentation occurs within 6-12 month period when acne eruptions heal and is the part of the inflammatory process. It remains for a longer period of time and, if untreated, eventually acquires whitish color and become scars. 1 Atrophic scars – form after inflammation which results in tissue defect. The classification used determines the most effective treatment methods or their combinations applicable to different forms of scaring resulting from acne in order to achieve the best results. In each case it is individualized depending on the severity of damage starting from: the exfoliation of upper – middle layers of the skin; measures promoting remodeling of deep skin layers; renewal of all skin layers by fractional laser Fraxel Dual; instantaneous application of stabilized fillers; and, ending with skin resurfacing or surgical interventions. After-acne scars form due to the lesions caused by inflammatory process. The inflammation takes place in hair follicles because of colonization of Propionebacterium acnes. The body’s reaction is the faster produce of white blood cells and inflammatory molecules. Sometimes, after the eruptions heal up, the damaged tissue does not return to its original position. Depending on the nature of acne eruptions, its localization and the damaged area, post-inflammatory pigmentation emerges as well as various forms of scarring which can be permanent. In more severe cases, with a higher inflammation, when infection spreads to the deeper layers of skin, or due to individual susceptibility, this results in a lack of tissue, and, either concave scars or, because of dysfunctional response of the body, hypertrophic scars form. Acne is a chronic inflammatory skin disease from which, in one or another form, about 85% of young people population and up to 5% of adults suffer. Its long duration, apart from being exhausting, accompanies the most beautiful years of life. To accept the remaining scarring is also quite a difficult task as the scars seem to remain forever. However now, when therapeutic, aesthetic and laser dermatology is greatly advanced, by applying modern treatment measures, it is possible to say goodbye to acne without bearing any trace of it. The key is to diagnose and treat acne, to understand its emergence, progress, accompanying factors and start an appropriate acne treatment taking into account its various forms. Apart from this, it is necessary to pay attention to skin care, to take the early preventive measures in dealing with formation of new scars. It should be remembered, that, in scar prevention, it is important to avoid squeezing pimples or otherwise traumatizing them. If the skin is continuously traumatized, healing time of eruptions becomes longer; deeper skin lesions for; post- inflammatory pigmentation is more pronounced; likelihood of scarring increases; often, a secondary infection can develop, which only exacerbates the condition of the skin. How long does the treatment of acne scars take? From several months to a year – this is directly influenced by the form of scars, their manifestation and duration of the condition. Does special skin care is required after the treatment? It is recommended to avoid direct sunlight for at least 3 weeks before and after laser treatment, follow doctor’s instructions for post procedural skin treatment. After smoothing out acne scaring, the recovery of skin is permanent. All you have to do further is continue to nurture your skin and enjoy the results achieved, use regular daily skin care products or those prescribed by the doctor. What is the best time to start scarring treatment – when it formed quite a long time ago, or soon after its formation? The earlier you start scaring prevention measures – the better the results. Scars that formed within 6 previous months are considered as recently formed. During this period, the mildest, natural measures and injections of biologically active substances, hyaluronic acid and plant extracts to the skin and hypodermis, as well as treatment procedures applying mesotherapy; biorevitalisation; a combination of alpha- and beta-hydroxy; TCA; and other procedures involving organic acids; peelings, promotion of collagen synthesis; Omnilux Revive 633 nm – red LED light therapy or other collagen treatments, facilitating healing of inflammatory acne cells and stimulating the production of new collagen; laser procedures. By combining skin treatments involving laser procedures, fruit and hyaluronic acid, and active substances, the damaged collagen in scar areas is restored. In addition, the skin is nourished with biologically active substances and vitamin cocktails. Daily care scheme for acne prone skin is made individually, by selecting active, ensuring stronger effect as well as preventive measures to stop the emergence of new eruptions. What is the treatment tactics for scaring that formed prior to 6 month-period? Laser therapy. This is one of the most advanced procedures providing the most effective results in acne scaring treatment. The effect of laser enables stimulation of collagen synthesis in the skin, so the scar surface becomes smoother. 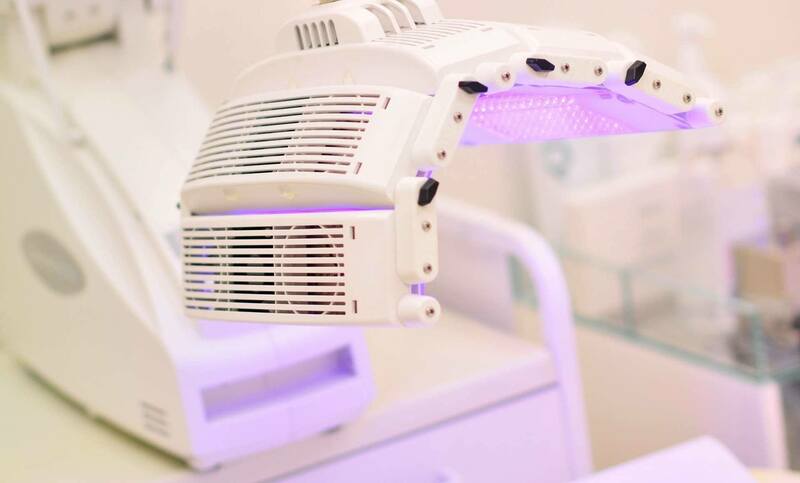 For this purpose, ablative (removing the surface layers of the skin) and non-ablative (the skin surface is maintained and only deep skin layers are affected by the laser) lasers are used. The advantage of non-ablative lasers is that there are no healing scabs. Another category of laser – the fractional lasers, during operation of which the beam affects not entire surface of the skin, but only its micro fractions – the microscopic laser light columns, perpendicular to the surface of the skin, penetrate into the skin removing old cells and leaving intact healthy skin in surrounding areas. This allows reach highly effective results with security inherent to use of ablative lasers. In case of active acne form, initially, the remission of a disease is achieved. 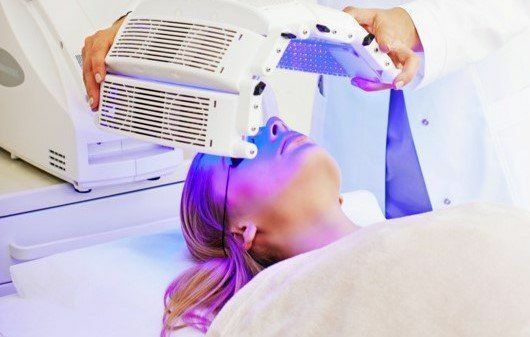 In this case, Omnilux Medical system proves to be the most effective, when use of a combination of blue and red light therapy causes 89 percent decrease in acne eruptions during a period of 12 weeks. Omnilux specific blue 415 nm and red 633 nm wavelength beams cause lasting remission of acne eruptions. Omnilux blue kills the bacterium P. acnes itself, which is involved in the formation of acne. Once bacterium is eliminated, inflammation process subsides. After destruction of the bacteria, Omnilux Revive red light used in the treatment provides anti-inflammatory effect andpromotes skin healing, sooths irritated skin. Thus, acne eruptions heal; new acne does not form; inflammation goes off; cellular processes come back to normal. The light emitted by Omnilux LED reduces sebum secretion as well as generation of inflammatory factors, which causes the amount of fat released by the sebaceous glands to return to normal level and the inflammation disappears. In addition, fibroblasts responsible for collagen production are stimulated, so there is an improvement in skin color and tone after the treatment. Omnilux Medical system combining blue and red, is the only scientifically proven system which causes long-term remission of acne eruptions. For more information about Omnilux medical and treatment of acne please read – Red light therapy. 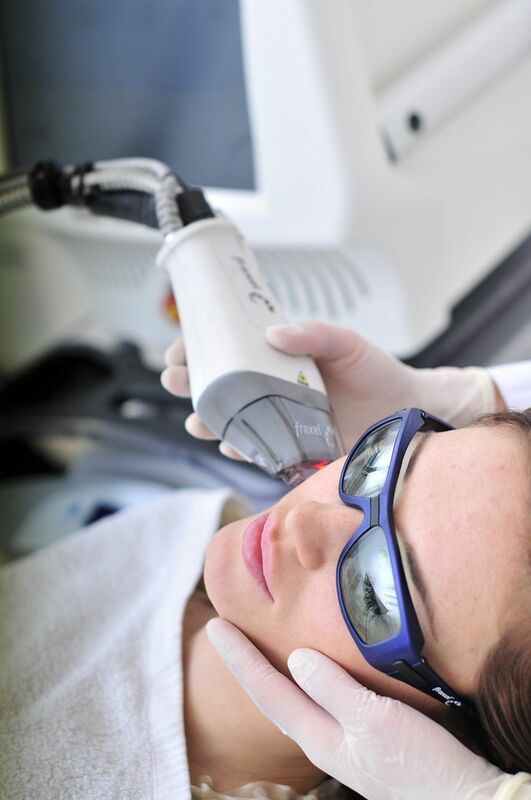 In case of acne, the pulsed dye vascular laser VBeam Perfecta reduces inflammation caused by acne bacteria and affecting small blood vessels, that from in inflammatory acne eruptions’ zones, coagulates them, which leads to their gradual absorption – the redness caused by acne scars is effectively removed and, at the same, new collagen synthesis is promoted and skin relief is smoothed out. As a result, redness, pink spots are gradually removed; acne eruptions disappear; scarring gets smoother. CO2RE laser vaporizes the upper layer of the skin at controlled levels of penetration and stimulates regeneration of new skin cells. Sometimes it is used in skin sanding or removing the zone collagen degeneration thus, stimulating the formation of new collagen fibers. Fraxel, the inventor of revolutionary skin rejuvenation that led to fractional skin renewal, quickly became No 1 technology providing the most effective treatment for smoothing out acne scars. The latest version of Fraxel lasers is Fraxel Dual that combines laser technologies of two wavelengths – 1550 nm and 1927 nm. This is a double performance laser providing double effect, rejuvenating the skin and removing all skin defects, when during one treatment the effect of the use of two lasers is achieved, and restructuring of all layers of the skin takes place: 1550 nm wavelength renews deep layers of the skin and, in addition, 1927 nm wavelength causes skin surface regeneration, removes pigmentation. During Fraxel Dual laser treatment procedure, not the entire skin surface is heated, but only its individual micro fractions. Microscopic laser columns renew MTZ (Micro Thermal Zones) of the skin, without damaging the surrounding tissue. Therefore, swifter skin healing and recovery is promoted, and post procedural period is minimal and skin-friendly. 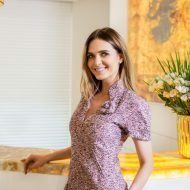 During the treatment, the old tissues are replaced by the skin of a completely new look – new healthy cells are generated; skin is youthful again and becomes smooth. The results currently achieved using the latest Fraxel Dual 1550/1927 nm technology can be compared to those, which, previously, were possible exceptionally by the use of very aggressive techniques. Fraxel Dual two-wavelength laser is efficient when dealing with both fresh and old acne-related skarring of all types – surgical, burn, atrophic, hypertrophic and other scars, stretch-marks and other skin defects. More information about treatment with Fraxel Dual laser can be found Fraxel re:store Dual.